glo’s unique zoomable interface provides simple, intuitive ways to visually browse a world of biblical content through 5 main lenses. You can visually browse all the content in terms of how it relates to biblical passages, to the geography of the Holy Land, to the biblical timeline or to topics that are relevant to you. You can use these lenses to filter content. Say you want to see what Jesus had to say on the subject of redemption during the Passion Week in Jerusalem. What would be an otherwise impossible search can be done quickly, visually and intuitively with glo. *Bible: Within 2 clicks, find a chapter faster than a paper Bible. The Bible is easy to navigate in its natural order and easy to read in a magazine format. *Atlas: Major stories and locations of the Bible appear geographically with a zoomable, Google-maps style interface along with map overlays, tours, photos and expert video. *Media: Browse a huge collection of HD video, virtual tours, articles, high-resolution photos, artwork, maps, historical animations. The video library includes the "In His Shoes" HD interactive documentary, that has stunning on-location footage and expert insight from Norman Geisler, Max Lucado, William P. Young, Dr. Joel Hunter and other scholars. *Timeline: View where events happened chronologically and in context with one another through a zoomable interface. *Topical: Relevant verses for thousands of subjects are searchable by keyword and include commentary from leading authors, scholars and other experts. This bible software is spectacular! I've never used software like this before. The graphics are phenomenal. The creators' attention to detail is something I'm very grateful for. Take for example the pull-out menu on the sidebar that's cleverly hidden, but slightly visible. You don't have to go searching for the menu or start over on the homepage. As you browse through the glo bible, you can change the font size, something I questioned when I first opened the page. It's as though they knew they'd have a broad range of ages using this software. When you're surfing through pages of a software program do you ever wonder how you got to where you are or try remembering what you've looked through already? glo saves each of your sessions (or pages) you've looked at! You have the option of saving the entire session when you close the program. glo is an amazing supplement to your bible. I don't see this replacing the bibles everyone brings to church on Sunday mornings (at least not any time soon), but I'm sure it is something the younger generation will find appealing in that setting. Can you just picture everyone showing up with laptops? If you're studying the bible, reading through it in a year, teaching a Sunday School class, or doing research, you won't find a more comprehensive program than this one. My daughter has our copy, which can be used on 3 computers, and it will be so beneficial at her college! I'm so thrilled she has this resource available. This is not your mama's virtual bible! The photos are stunning and the information linked with each one is more than I would've ever learned on my own. The creators really kept those of us who have never made it to the Middle East in mind. I had so much fun flipping through the pictures and learning about different historical landmarks. glo will soon have mobile media available for those of you with iPods or mp3 players! You'll have to check with them as they get it ready. They are also working on the Share option which includes bookmarks, scripture and media by sending a link to friend. Share glo with others with a temporary authorization for your friends. Since we are socializing so much online glo is creating more social components coming soon through free web updates, including interactive Bible studies, sharing notes, accountability tools and methods to encourage and keep up with friends. I think my biggest issue with this software is how long it takes (or used to take) to install. We finally got it loaded onto my daughter's laptop Friday afternoon. Turns out that weekend the team at glo created a "quick download" option. Isn't that the way life goes sometimes? Instead of taking 3+ hours to install they have a much quicker option now. Lucky you! *Bonus to this software? You can use the same Product Key on 3, yes 3, different computers!!! 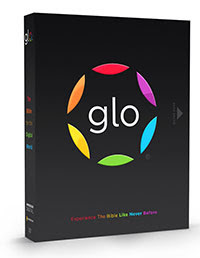 I'd like to thank the makers of glo for allowing me the privilege of reviewing this amazing software. They are providing my commenters with 2 copies to win! The giveaway will run through December 14th, 10pm CST. Must be 18 yrs or older and be a US resident. You MUST complete the required entry and leave an email address to be entered. Without doing both of those you entry will NOT count for the giveaway. You are responsible for the correct number of entries in this giveaway. Void where prohibited. *Another opportunity to win: Visit http://www.globible.com/. At the bottom of their homepage, the 2nd column, bottom link is a Twitter Sweepstakes that will tell you how you can win through their website! Sweet, I know! I love the spiritual home base that you can use to track your verses and feelings! I signed up for the Glo newsletter. Your button is on my scrolling sidebar. Your button is in my scrolling sidebar. I'd use all the features. It looks tons better than Ilumina. Please enter me. Signed up for glow newsletter. Following glo on Twitter and tweeted under onedesertrose. I think I'd use all of the features, but the most interesting one, right now, looks like the topical feature. I'm now following Glo on Facebook. I like that it's more efficient than a paper Bible. I think I'd like using the virtual tours to bring Bible stories to life! I think I'd really enjoy the virtual tours. Love the virtual tours options! WOW! This looks like amazing software. I love the time line and the atlas, those are so helpful when reading Old Testament books. I love anything that has to do with maps so the atlas feature would be wonderful. I know my husband and I would enjoy this. WOW what an amazing program. I can't just pick one option. This is something that would be great to use with my girls so we can walk through the bible together and grow with God together. They would absolutely love the graphics and videos. I'd like being able to see the events where and when they happened. This looks great, Mimi! The feature I'm most interested in is the My Glo (spiritual home base). I've become a fan on FB. I signed up for the blog feed. I love GLO! Its an amazing program and I love that The Bible is easy to navigate and read. I can't wait to try out the virtual tours and the social media aspect of GloBible - what a neat product!! I would love to be able to see on the maps and with the beautiful pictures where certain events took place as I am reading through the bible, that would be way cool! I would love to be able to see the breakdown of the Bible books when I'm looking for a certain story. It would be awesome to just flip from book to book and see it all overviewed! Following Glo on Twitter and Tweeted the contast @thosewithyoung. You've gotta love the timeline feature. it makes learning biblical history a snap! This would be SO great to win. My husband and I have been eyeing this. I think one of my favorite features would be the atlas. It looks so neat at how you can actually seen video's of the places from the Bible. Very cool! Thanks! I'm a fan of Glo on facebook! Thanks! I would use the How do you feel part a lot! Having it mobile at some point would be great as well. The Timelines feature looks great! I sooo would LOVE to win this!! It sounds amazing!! 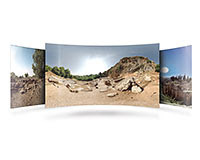 I would love to use the virtual tours to bring the Bible stories to life! *Hopeful to win*. Fan of Glo on Facebook! I became a fan of Glo Bible on Facebook! I would love Glo because of so many things! I think the most useful and interesting is the virtual tours! Love that! I Twittered about the Glo drawing and posted your blog addy. I know I would love the atlas - that always fascinates me, but to be virtual would be amazing! My kids and I could use this in school! I'm now a fan of Glo on facebook as Janna Ryan. I think GloBible looks amazing!! I would love to have a copy to use the interactive maps and timeline features. I know I would use this during my own bible study time but also with my kids. I love this giveaway!!! I signed up for the GLo newsletter! I became a fan of Glo on Facebook! I signed up at Glo for their newsletter. This program looks really exciting. Right now I think I would benefit most from the feelings application. To be able to look up scriptures based on what I am dealing with that day would be fabulous. I love the details in the atlas as well. The boys would really enjoy this. And to be able to use it on three computers. WOW! one more for signing up for the newsletter. I would love to win the Glo Bible! I may give it to my son-in-law who just graduated from Bible school and is going to be a pastor. I absolutely love the fact that it will track your feelings. That is something that is so key for me to reflect on how passages affect me when I'm in a really good mood versus blah. I love this! ooohhh the virtual tours would be great! being able to track would be great too!